When the winter chill arrives, this hat is perfect. 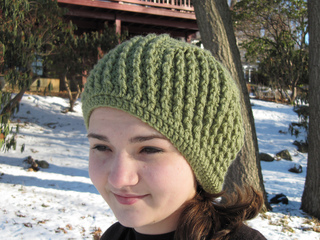 It’s cozy and large enough to keep ears warm. 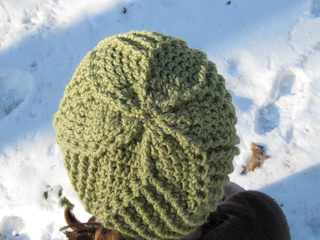 The ridges, formed by post stitches, whirl up the sides, slowly decreasing into a beautiful flower shape. This hat is sure to be a hit with any recipient. 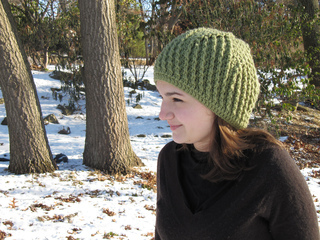 Sample made in Lion Brand Vanna’s Choice 100% acrylic (3.5 oz 100 g, 170 yd 156 m), 2 skeins of #174 Olive. sample shown in photo was a finalist in the Michael’s Lion Brand Vanna’s Choice Contest of 2009. Errata: Updated 2/14/2013 After Rnds 6-9, repeat Rnd 4 once more.